Imagine walking down the street and a car pulls up and the occupants shoot at you. After you get away safe, the first thing you would do is call the cops. That’s not what happened January 13, 2019 on the 200 block of E. Armstrong Street. The suspect was smart, and ran away, as one of his assailants fired shots at him. The victim never called the cops. The only reason police know about this, is because residents came outside and saw bullet holes in their houses and vehicles. 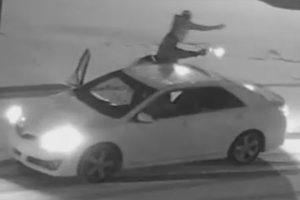 On Sunday January 13, 2019 at 1:03 AM, the occupants of a 2012-2015 white Toyota Corolla are captured on video surveillance firing multiple times at an unknown victim while in the 2XX block of East Armstrong Street. The footage shows four (4) suspects firing at the unknown victim. One suspect chases the victim down the street on foot towards Baynton Street, firing the entire time. The offenders then fled in the Toyota towards Rubicam Street. The next morning numerous resident in the area called police reporting bullet holes in homes and vehicle. No shooting victim was located and Northwest Detectives is also attempting to identify the individual that was being shot at. Suspect Description: Four males all armed with handguns. Males appear to be 20 years-of-age wearing dark colored clothing and blue jeans. Vehicle Description: Possibly a 2012-2015 white Toyota Corolla sedan.